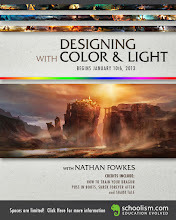 Nathan Fowkes Art: Upcoming Events! From Student to Professional and Beyond! A one evening presentation. Monday, June 25, 7-10:00 pm. For any student or professional artist seeking improvement (art of any kind, digital or traditional). The presentation will emphasize where and how to focus your efforts as you work toward developing a more professional level of artistic ability. I invite you to take a chance on this one, it will be worth your time! Click here for more detail! 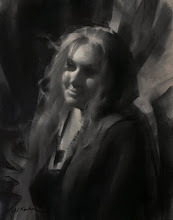 To enroll contact The Los Angeles Academy of Figurative Art, (877) MY-LAAFA (695-2232). This event is held at the Animation Union: 1105 N. Hollywood Way, Burbank, CA 91505. Watch the video introduction here. 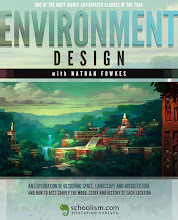 How to focus your efforts to successfully prepare for a career in animation art and entertainment design. The workshop will consist of slide shows, lectures and demos that will take you through the design and development process for an entertainment project, showing you exactly what skills are needed for each aspect of the project and how to develop those skills. The emphasis will be on production concept art, including: look development, color scripting, location design, prop design, color keys, lighting design, matte painting, working with your art director and putting together an effective portfolio. If you’re working toward a career in animation and entertainment design, this workshop is not to be missed!